Groves, C. P. 1981. Ancestors for the Pigs: Taxonomy and Phylogeny of the Genus Sus, Australian National University Press, Canberra. Groves, C. P. 1997. 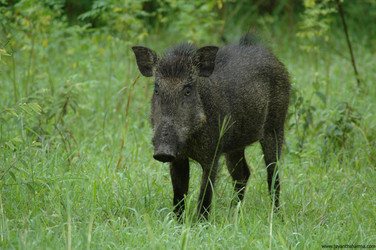 Taxonomy of the wild pigs (Sus) of the Philippines, Zool. J. Linn. Soc. 120:163–191. Groves, C.P. and P. Grubb. 1993. The Eurasian suids, Sus and Babyrousa—taxonomy and description. Pages 107-111 in: Oliver, W.L.R. (Ed. 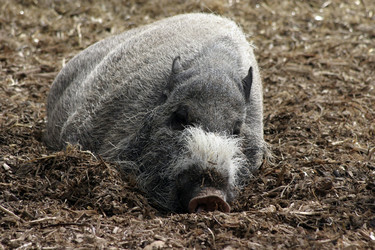 ), Pigs, Peccaries, and Hippos. Status Survey and Conservation Action Plan. International Union for the Conservation of Nature, Gland. Mona, S., E. Randi and M. Tommaseo-Ponzetta. 2007. Evolutionary history of the genus Sus inferred from cytochrome b sequences. Molecular Phylogenetics and Evolution 45(2):757-762. Robins, J. H., H. A. Ross, M. S. Allen, and E. Matisoo-Smith. 2006. Taxonomy: Sus bucculentus revisited. Nature 440:E7. Page: Tree of Life Sus. Eurasian pigs. The TEXT of this page is licensed under the Creative Commons Attribution-NonCommercial License - Version 3.0. Note that images and other media featured on this page are each governed by their own license, and they may or may not be available for reuse. Click on an image or a media link to access the media data window, which provides the relevant licensing information. For the general terms and conditions of ToL material reuse and redistribution, please see the Tree of Life Copyright Policies.